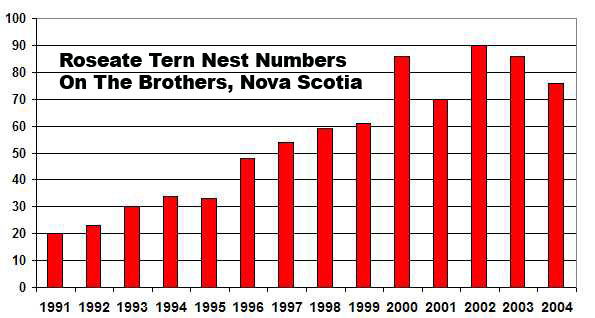 The following is a synopsis of the tern status in southwest Nova Scotia for the 2004 nesting season. My "tern" work and observations deal primarily with the tern colony on The Brothers. These two tiny islands are located about 1 km offshore from Lower West Pubnico in Yarmouth County. 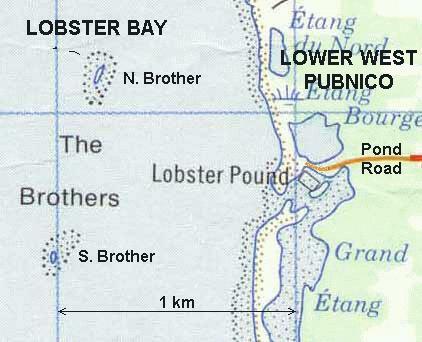 The first terns arrived in Lobster Bay on May 1, 2004. One cripple Great Black-backed Gull and 3 Great Black-backed Gull nests were removed from South Brother. One Great Black-backed Gull nest was removed from North Brother. On June 12, 2004 there was one Great Black-backed Gull nest with two 7-day old chicks in the centre of the tern colony on Île-aux-fraises (a.k.a. Green Island). These gull chicks were unfortunately left there unharmed. By mid-season, the tern colony of 459 nests was abandoned. Perhaps I should have requested permission from CWS to remove them. Census on Île-aux-fraises - June 12 - 459 Common and Arctic Tern nests (up from 362 in 2003), 90 to 95% Common Terns. The number of Roseate Tern nests, at 76 on The Brothers, was slightly down from the 86 of the 2003 season. Fledgeling success during the last two seasons, though, has been pretty close to zero, due to predation by mink and also in part by some sort of avian predator. Before the mink attacks I had counted as much as 58 Roseate Tern chicks (June 28). The mink attacked the colony between July 4 and July 11 (most likely closer to July 11). It was captured in a lethal trap on July 16. It is quite possible no Roseate Tern chicks fledged from The Brothers in 2004 as was the situation in 2003. The majority of the chicks of all three species of tern were killed by the mink. Only a few carcasses were actually eaten. 10 to 12 adult Roseate Terns are believed to have been killed by the mink. Most of these carcasses were collected and later picked up by CWS. At least one adult Roseate is believed to have been dismembered by an avian predator. About 10 adult Common and Arctic Terns also appeared to have been dismembered by some sort of avian predator. Owl? A few adult Common and Arctic Terns are also believed to have been killed by mink. Green Rock (also shown as "Green Island" on the charts) had a small amount of Arctic Tern Nests (perhaps 10 pairs). Little Half Bald Tusket Island (a.k.a. Inner Bald and Mossy Bald) appeared to have had a small tern colony in 2003 and in 2004. I did not land on the island but only motored by. All in all, a devastating year for the terns of south-west Nova Scotia. What to do to ensure success for the 2005 nesting season. The following is a chronological listing of my 2004 work with terns in general, of the Lobster Bay area, but especially with the Roseate Terns of The Brothers. The report also includes tern observations from other local residents. May 1, 2004 - Lobster fisherman, Arthur d'Entremont, reported about 4 "terns" a few kilometers south-west of The Brothers. May 3, 2004 - Jerome D'Eon reported seeing 2 terns in Pubnico Harbour near Walter Surette's fish plant. May 5, 2004 - I visited The Brothers accompanied by Israel d'Entremont. All was well. We saw no terns and found no gull nests. We fixed up a few Roseate Tern nest shelters. May 6, 2004 - Raymond S. d'Entremont reported seeing about 50 terns above The Brothers. Lobster fisherman, Robert Nickerson, also reported a few terns above The Brothers. May 8, 2004 - Lobster fisherman, Réal d'Entremont, reported 200 to 300 terns above The Brothers at 6am. May 10, 2004 - About 125 terns at Île-aux-fraises (a.k.a. Green I.) - about 90% Common Terns and 10% Arctic Terns. We saw a few terns around Little Half Bald Tusket I. I was expecting more tern activity there. There was only a little tern activity on Flat Island and no activity on The Brothers as we motored by. My crew: Israel, Rémi and Jean-Bernard d'Entremont. May 19, 2004 - I went alone to visit The Brothers in fog about as thick as pea soup. I found about 100 terns (all 3 species) above North Brother, but only one tern at South Brother. There were no gull nests on N. Brother. Due to a heavy swell, I did not attempt a landing on S. Brother. May 27, 2004 - On S. Brother, I removed a cripple Great Black-backed Gull and 2 GBb Gull nests each containing 3 eggs were destroyed. There were a a few terns above the island including some Roseate Terns. No tern nests could be found on S. Brother. Several hundred gulls and some Double-crested Cormorants were using the island as a roost as we arrived. On N. Brother, the tern and gull situation was better. Only one GBb Gull nest was destroyed. It contained 2 eggs. There were about 300 terns on N. Brother including all 3 species. We also counted 95 tern nests as we walked around the island. None of these could be positively identified as Roseate Tern nests. Most of the nests contained one egg; a few with 2 eggs and only 2 or 3 with 3 eggs. I expect the Roseate Terns to begin laying in early June. I hope to do my yearly nest census in about 2 weeks when the nest numbers will be at its maximum. One tern egg appeared to have been opened by some predator; only half of the shell remained. June 4, 2004 - Destroyed one GBb Gull nest from S. Brother. No tern nests on S. Brother and very little tern presence above the island. We counted about 415 tern nests on N. Brother including about 35 Roseate Tern nests. There were no gull nests to destroy. I expect a good tern nest census when I will do my official count in about 10 days. Crew and helper: Israel d'Entremont. June 12, 2004 - Official census day on Île-aux-fraises (a.k.a. Green Island) and The Brothers. We counted 459 Common Tern and Arctic Tern nests on Île-aux-fraises. About 90% were Common Tern nests; there was no presence of any Roseate Terns. Two 7-day old Great Black-backed Gull chicks were also found on Île-aux-fraises. Even so, the tern colony appeared in great shape. The situation on The Brothers was not as good as I had expected. 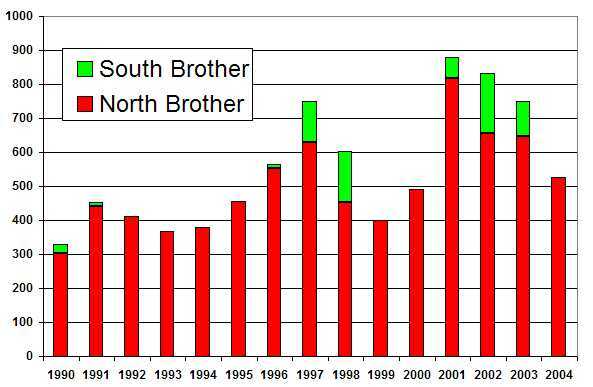 There were no terns on South Brother and the number of tern nests on North Brother was down to 526 from 648 in 2003. There were 102 tern nests on South Brother in 2003. The number of Roseate Tern nest was only marginally down to 61. On June 13, 2003 there were 68 Roseate Tern nests on The Brothers. I expect more Roseate Tern nests in the coming weeks. Now to some grim realism. Six adult terns were found dead on North Brother; 2 Common Terns and 4 Arctics. Some had been dismembered as if taken by an owl; others were intact. One Common tern had a broken bill. One of the Arctic Terns had been freshly killed with an injury to the head, its blood on the vegetation was still wet. I collected the fresher carcasses and stored them in my freezer for later analysis, if required. The question is, "Are these the result of an owl or a Mink attack, or both?". Mink have been observed on the mainland adjacent to The Brothers and are known to have killed a flock of tame ducks there this spring. I will await instructions from Canadian Wildlife Service or from the wildlife division of the Nova Scotia Department of Natural Resources as to what to do next. Crew: Rémi and Israel d'Entremont. June 16, 2004 - Bill Moseley, a trapper hired by DNR, placed 4 mink traps on N.Brother. He located what looked like possible mink paw prints in the fine soil below the overhanging bank of the island. June 17, 2004 - Israel and I checked out the mink traps on N. Brother. They were all untouched and there were no more dead terns. We will leave the traps there for the season. The eggs were starting to hatch. Only one, believed to be a Common Tern, was fully hatched and one Arctic Tern was starting to peck through the egg shell. All appeared well. A few more Roseate Tern nests were located. Now there is a total of 65 documented Roseate Tern nests and their eggs should begin hatching soon. June 21, 2004 - Another mink trap check on N. Brother. All traps o.k. About 100 Common and Arctic Tern chicks had hatched. Two dead Common Tern chicks were collected; one appeared to have been pecked to death (possibly by an adult tern?). The cause of death of the second chick was undetermined. Three more Roseate Tern nests were discovered bringing the total now to 68. We found no Roseate Tern chicks yet. Israel d'Entremont was my assistant. June 22, 2004 - Again, no mink presence to report on N. Brother. The Roseate Tern eggs were beginning to hatch. Six RT chicks were found. No mortality of any kind on the island. All appeared excellent on N. Brother. Crew: Israel, Rémi and Jean-Bernard d'Entremont. June 28, 2004 - Another visit to N. Brother to check the mink traps and to survey the Roseate Tern nests. My assistant was my son, Nigel. The mink traps remained untouched, however, there was evidence of a predator. Two Arctic Terns and one Common Tern were decapitated with a variety of stages of dismemberment suggesting perhaps the possibility of an owl? We also found about a dozen dead Common Tern chicks, one of which appeared to have recently fallen from the overhanging sod bank and was collected. On a brighter note, 8 more Roseate Tern nests were discovered bringing the total now to 76. Also 58 RT chicks have been documented. Unfortunately one of these chicks was found dead and three more RT chicks, all about 2 or 3 days old were just barely alive. Two of these chicks had an older sibling which appared healthy. I am very pleased with the state of the colony at this time. July 4, 2004 - All was still good on N. Brother. A few new dismembered carcasses were located. All the Mink traps fine. July 11, 2004 - Disaster on N. Brother. Nigel and I went to N. Brother to do some observation from a portable blind. We first checked the mink traps and found one had been sprung by a female Common Eider. It was dead in the trap. We also found a few adult terns which had been dismembered, including decapitation. One such bird was an adult Roseate Tern on the observation platform; its head and wing below on the ground. This was all minor. Likely the result of owl predation? The great disappointment came when we started checking the nest structures for Roseate Tern chicks. We were only able to find three still alive. One of these was under a lobster crate with a dead Adult Roseate Tern and a dead, almost fledged, Common Tern. The adult Roseate had a recent injury to its head. This bird was collected. Adult Roseate Terns and chicks were in many nesting structures. Most of the adult tern mortality was very recent. One adult Roseate and one adult Common Tern were still alive with injury to their necks. They had incoordinated movement and could not walk or fly. The injuries appeared consistant with the Mink kills of 2003; dead birds with blood or visible injury to head or neck. Five recently deceased adult Roseate Terns were collected for later study by CWS. There will be no Roseate Tern chick banding this year. As to the blind, we did set it up and observed the terns for about 90 minutes. There was definitely less tern activity than my last observations from a blind there of two years ago. We saw no terns with leg bands and none of the dead birds had been banded. Some of the fish being brought looked like herring; a couple of Roseates were carrying Sand Lance. A few Common Terns were trying to feed their young with Butterfish with no success. Nigel saw a tern with a large dark greenish fish, perhaps a mummichog. All in all, the tern activity in N. Brother was much lower than expected. We also kept an eye out for predators but saw none while we were there. July 14, 2004 - More traps to capture the mink(s) were placed on N. Brother by retired biologist, Paul Tufts. Paul examined several tern carcasses and confirmed them as mink kills. I collected two Roseate Tern mink kills and one Common Tern which appeared to have been killed by an avian predator. We found 3 Roseate Tern chicks still alive. I just received a phone call of a Black-crowned Night Heron in one of the ponds on the mainland in plain view of N. Brother. I don't know if this is significant. I know these birds have attacked tern colonies elsewhere. Israel d'Entremont was our helper today. The weather was miserable. Oh, I forgot to mention that a two week old Common Tern chick was killed by one of the mink traps. Presumably, it had fallen off from the overhanging turf bank where it had been hatched, and had walked into the trap. July 16, 2004 - We caught a mink! Whether it is the one and only is yet to be determined. One of the traps placed at the base of the sod bank had again killed an almost-fledged Common Tern. This was not the same trap as the one on July 14. The two sprung traps were reset before we left the island. We found very few newly dead terns. The adult birds were still bringing in fish. My assistants: Israel and Rémi d'Entremont. The frozen tern carcasses were picked up by CWS staff and the dead mink was delivered to the DNR office in Tusket. July 20, 2004 - No more new dead birds on N. Brother. Two more adult Roseate Tern carcasses were found. They appeared a week or so old and had died before the mink capture. One of the mink traps had killed a Spotted Sandpiper. My crew: Ric Surette with his sons, Andrew and Jonathan, and Jean-Paul d'Entremont. July 24, 2004 - Another bird killed by a mink trap on N. Brother. This time, a Willet. No new dead terns were found. Some Common Terns had fledged. Still a lot of tern activity. Crew: Ric Surette with his sons, Andrew and Jonathan, and Nigel D'Eon. July 30, 2004 - The 7 mink traps were removed from N. Brother. They were all still set. All the terns were gone from the island. This seems earlier than usual. August 1, 2004 - I have heard from Donny Jacquard of Wedgeport, that the terns abandonned Île-aux-fraises (a.k.a. Green I.) by mid-season. No explanation so far. Note that on June 12, there were two 7-day old Great Black-backed Gull chicks on the island, in the middle of the tern colony.